There has been loads of research about the human brain and how it learns. Because of its complexity most theories use metaphors to explain how we learn in an over-simplified way. If you are a coach, leader or a learning professional knowing this is extremely valuable if you want to create compelling, engaging and effective learning environments. To make natural learning much more interesting, effective and faster it’s important to use the whole brain. Your mind and body are inter-connected in a myriad of ways. Therefore, learning happens at a mind, body, emotional and a cellular level… It’s not just confined to your head! However, education has traditionally taught us to separate the mind and body. Most learning is undertaken by the ‘head’ – rational processes ignoring the senses and our feelings. As we grow, the dis-connection between the mind and body becomes wider. Feelings are pushed down or ignored as these are seen as ‘soft’ and ‘weak.’ We are taught to sit down, stay still and learn! Not very natural at all! Many learning environments are created around the head and NOT the whole – even though research has proved that thinking and bodily movement are closely connected in the brain…both enhance learning. This is known as behaviorism and stimulus and response (carrot and stick) has had a huge impact on learning, especially in the corporate world. It prescribes learning into Personal Development Plans (Personal Fixing Plans as I call them) that doesn’t lead to real sustainable growth. My favourite brain theory is the Triune Brain proposed by American physician and neuroscientist Paul D. MacLean, because it uses the metaphor of three brains-in-one. Each are inter-connected and inter-linked. All three have specialist functions that relate and interact with each other. Reptilian or Lizard Brain – Our primitive brain was the first to evolve. It’s mostly responsible for survival and involuntary responses such as your heartbeat and breathing – instinctive and repetitive behavior. Our lizard loves routine and rituals and it instinctively becomes an animal if it perceives a threat. 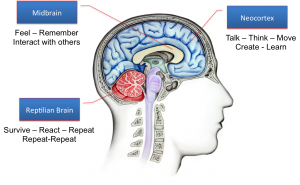 Limbic System – Or the Mid-brain. This is our social and emotive brain. Responsible for feelings through our senses and is responsible for long-term memory. …What does it have to do with learning? Each specialist area subtly interacts and inter-relates in important and complex ways. Traditionally, most of us are conditioned to learn using our Lizard Brain through rote learning and repetition – learning was done to you. You were a passive participant driven by hierarchy (teacher or Human Resources!). The key motivator was fear of failure with little concern for your thinking or feelings. Feelings were probably seen as a negative weakness that got in the way. It’s easy to create order takers and a command and control culture. Individuals lose their ability to make decisions and problem solve because of this hierarchical approach to learning. So how can these three brains help us to learn? The Lizard Brain is still important for us in the learning process and we certainly don’t want it to stop because routine and precedent setting is good and positive (we also need to keep breathing right?!). The Limbic System has a profound effect on the quality and quantity of your learning through connection with your emotions. Self-awareness and self-management can be profound. It also provides us with a checkpoint for common sense – common sense is not always common practice! Negative feelings slow learning or even stop it altogether as we retreat to our Lizard Brain for protection to defend ourselves from a perceived threat. Creating an environment for negative feelings as you train, coach or lead individuals will make them become defensive and compliant, especially if you’re getting them to compare and compete with each other. This is not an effective way for people to learn. You’re triggering their inner lizard. Learning will slow or stop altogether because they down-level into stress and survival. Creating an environment where positive feelings are experienced helps your learner to relax, open up and Uplevel into their third brain: Neocortex function where thought, problem solving, planning, creativity, and pure learning takes place. All learning experiences should exercise the Neocortex. This is known as the learning brain! Here where individuals get to think for themselves, recognize any feelings associated with their thinking, create conscious action, and get positive results. You help others to become leaders of their own learning by holding space for their creativity and imagination, allowing them to create meaning and value by navigating the information instead of writing it down and storing it away for later (later NEVER happens!). Learning is much more than sitting still and writing notes. Our brains continue to grow and create new neural pathways into old age. So learning is life! Hope your development plan isn’t a fixing plan in disguise! Great article! I totally agree with you that all three parts of the brain have their own function in the learning process. Are you aware of any research on how making music (in my case playing piano)affects the development of the neocortex? If so, would you please let me know? Many thanks in advance! Hi Marie-Astrid thanks so much for your comment. I’m not aware of any research for this as such, but I’ll keep my ear to the ground and if I do find anything I’ll let you know here. loved the article ,I am going to put something similar on my own website ,as I feel its an important step to understanding ,but I have been researching this for years . If you search for the “breakdown of the bicameral mind ” that author Julian Jaynes its am amazing thoery also . Please feel free to contact me ,number is on the website . ← Stop Judging Other People!